Former President Barack Obama said House Minority Leader Nancy Pelosi, who is running to be the next House speaker when Democrats take the majority in January, "will go down as one of the most effective legislative leaders that this country's ever seen." Obama spoke before a live audience in an interview with former adviser David Axelrod for his podcast, "The Axe Files," produced by the University of Chicago and CNN. "Nancy is not always the best on a cable show or with a quick sound bite or what have you. But her skill, tenacity, toughness, vision, is remarkable," Obama said, giving Pelosi a boost the week before House Democrats vote for their party leader. "Her stamina, her ability to see around corners, her ability to stand her ground and do hard things and to suffer unpopularity to get the right thing done, I think, stands up against any person that I've observed or worked directly with in Washington during my lifetime." Democratic Rep. Marcia Fudge, who was considering challenging Pelosi, said she would instead support Pelosi after the Democratic leader announced her intention to restore the Elections Subcommittee of the Committee on House Administration and name Fudge the new chair. Although a faction of Democrats remain opposed to Pelosi, her grip on the Democratic caucus is likely to hold. Obama also commented on the 2020 presidential election, and the key characteristics for Democrats considering running. He said he believed Beto O'Rourke, who narrowly lost a Senate bid in Texas, was an "impressive young man" who "based his statements and his positions on what he believed." 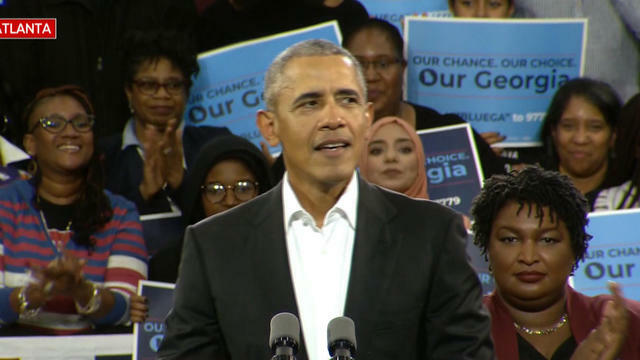 "The reason I was able to make a connection with a sizeable portion of the country was because people had a sense that I said what I meant," Obama said. "What I oftentimes am looking for first and foremost is, do you seem to mean it? Are you in this thing cause you have a strong set of convictions that you are willing to risk things for?" Obama said "a number of people who are thinking about the race" fell into that category, and that several potential candidates were "friends of mine and whom I deeply respect."